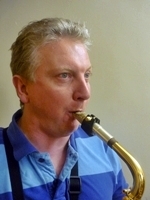 Best known in the region as an alto saxophonist, Keith was a founder member of Saxophonics, over a decade ago. It is in the last two years that the quartet has really blossomed and gathered momentum, enjoying highly acclaimed performances at jazz venues and festivals around the North East region, including the Sage Gateshead International Jazz Festival on more than one occasion. Under Keith’s leadership, Saxophonics live performances are renowned for exciting, tight, and intricate arrangements with fiery solos from all members. Very much at home playing in larger ensembles too, Keith co-founded the jazz sextet Alter Ego, he has played with John Warren’s Splinter group, and he was the musical director and lead alto sax with the Customs House Community Big Band for many years. He was recently selected to play alongside International jazz saxophonist Andy Shepherd at the 2013 Gateshead International Jazz Festival, playing tenor on this occasion. 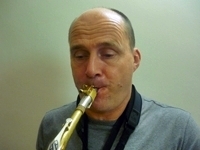 Through the day, Keith is a woodwind tutor in Newcastle schools and saxophone tutor at Newcastle University. Reeds man Niall has played Bari Sax for Saxophonics for over a decade. Playing a wide assortment of instruments from piccolo to bass clarinet, he has earned his stripes playing in big bands, including The Voice of the North, function bands, jazz outfits, such as Alter Ego, and woodwinds for musical theatre. Recently he has started to contribute material for Saxophonics. The musical range and scope of the saxophone quartet affords great freedom to the writer, whilst the improvisational ability and versatility of this group can give flight to his ideas. His influences include Stan Kenton, Don Ellis, Messiaen and a certain G.B. Wilson. Steve Summers has been gigging in and around Newcastle since he was 15 years old. He is a regular contributor to a variety of jazz outfits including sax quartet combos, latin and big bands, playing soprano, alto or tenor saxes as well as percussion. He is currently playing lead alto with The Strictly Smokin’ Big Band. 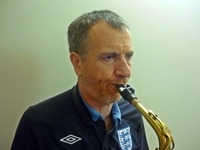 The Saxophonics quartet has been the longest regular musical project for him, stretching over 10 years. After playing Soul and R&B in club bands for a number of years and then having some time away from music, Alan became interested in Jazz and started playing in the Customs House Big Band with Keith. Since then, he has been an active member in a number of local bands playing various styles and formats. He was very happy to be asked to join Saxophonics in 2015 and is really enjoying the challenge of playing in the quartet.